February 4, 2012 /Photography News/ Responding to public demand, NASA just released a 'Blue Marble' image of the Earth taken from the VIIRS instrument aboard NASA's most recently launched Earth-observing satellite - Suomi NPP. 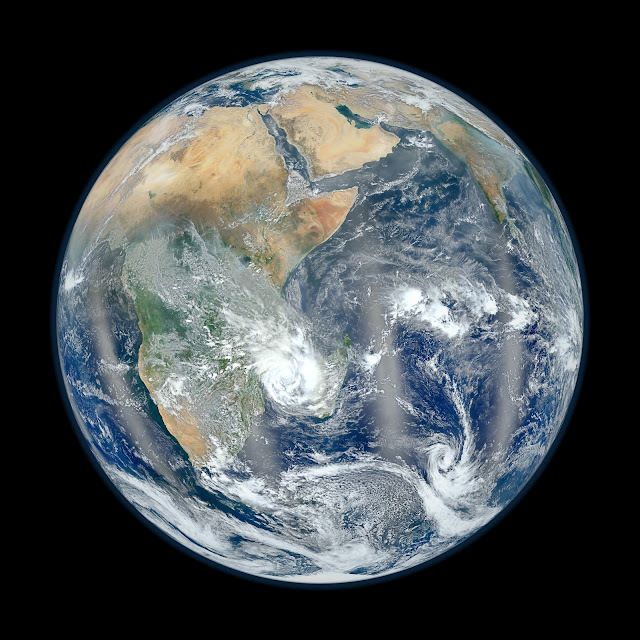 Compiled by NASA Goddard scientist Norman Kuring, this image has the perspective of a viewer looking down from 7,918 miles (about 12,742 kilometers) above the Earth's surface from a viewpoint of 10 degrees South by 45 degrees East. The four vertical lines of 'haze' visible in this image shows the reflection of sunlight off the ocean, or 'glint,' that VIIRS captured as it orbited the globe. Suomi NPP is the result of a partnership between NASA, NOAA and the Department of Defense.